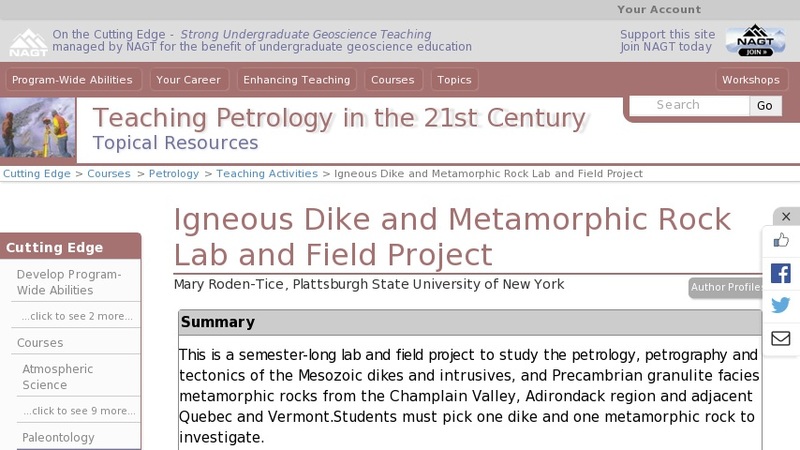 This is a semester-long lab and field project to study the petrology, petrography and tectonics of the Mesozoic dikes and intrusives, and Precambrian granulite facies metamorphic rocks from the Champlain Valley, Adirondack region and adjacent Quebec and Vermont. Students must pick one dike and one metamorphic rock to investigate. A sign-up list is provided and thin section preparation is done during lab time. The results of this project are presented to the class during the final exam period instead of a final comprehensive exam. This project allows the students to integrate petrography of igneous and metamorphic rocks with regional field relationships and tectonics. The students really enjoy being able to pick their own samples to study and make their own thin sections. This is done during the winter months. In the spring, we go to all the locations to study the field relationships and relate them to the regional tectonic setting both in the Precambrian and the Cretaceous. There are four afternoon field labs and one weekend field trip to study the Mesozoic dikes and intrusives and Precambrian metamorphic rocks in New York, Vermont and Quebec. The requirements for this project are as follows: Make two usable thin sections. Write a detailed petrographic description of each sample including a hand specimen description. Write a detailed field description of each outcrop visited including strike and dip (attitude) if possible. Sketches or photos are necessary. Research the available literature on the samples and summarize how the samples fit, in terms of petrography, structural and tectonic setting. Cite the references used. Include all of the above written descriptions in a short summary report, 2-3 pages in length. Present the results to the class during the final exam period. This year, I made the presentations count for the final exam. It seemed to be a more productive course summary than memorizing and regurgitating material.